I bet you are wondering why in the world you would want to know how to cut a glass bottle in half. Isn’t that dangerous? (yes!) Don’t you need special glass cutting tools? (no!) Maybe you want to start trying your hand at upcycled crafts. Maybe (like me!) you have a 16 year old son who proposes the idea to his Advanced Placement Environmental Sciences teacher as his midterm project. Even though you TOLD the 16 year old boy that it wouldn’t be as easy as those YouTubers made it look on the internet. And of course, being a 16 year old boy…he ignores you and decides to do the project anyhow. Because that’s just how teenagers roll, right? 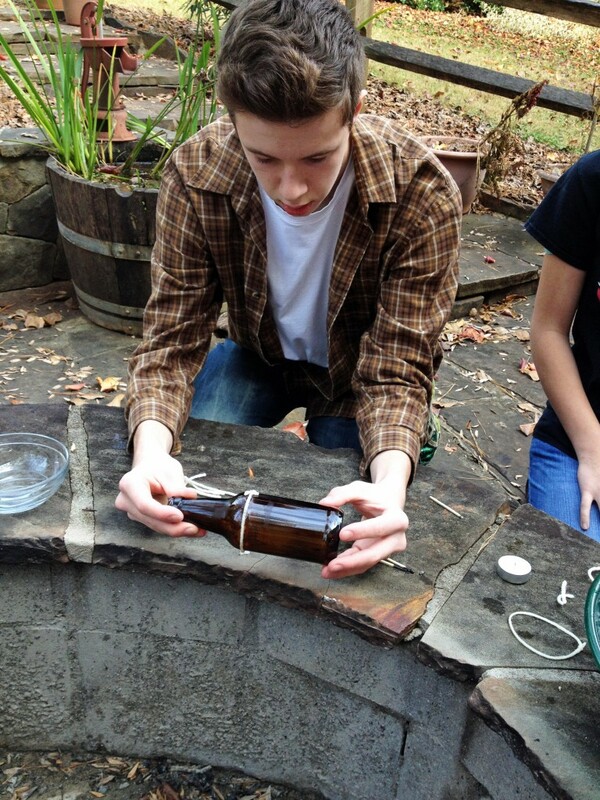 So, here is our experience last weekend in learning how to cut a glass bottle in half with string. This is NOT a Pinterest worthy, beautiful upcycled crafts project where everything is perfect. Far from it! I will leave you a link at the end of the post is you want ‘perfect’….this isn’t it! But, we learned a lot and I wanted to share our experience in case you wanted to try it for yourself. I did not take my DSLR camera outside for this project, either. Because the idea of my very expensive camera anywhere near my son, fire, and a bowl of ice water made me way too nervous. 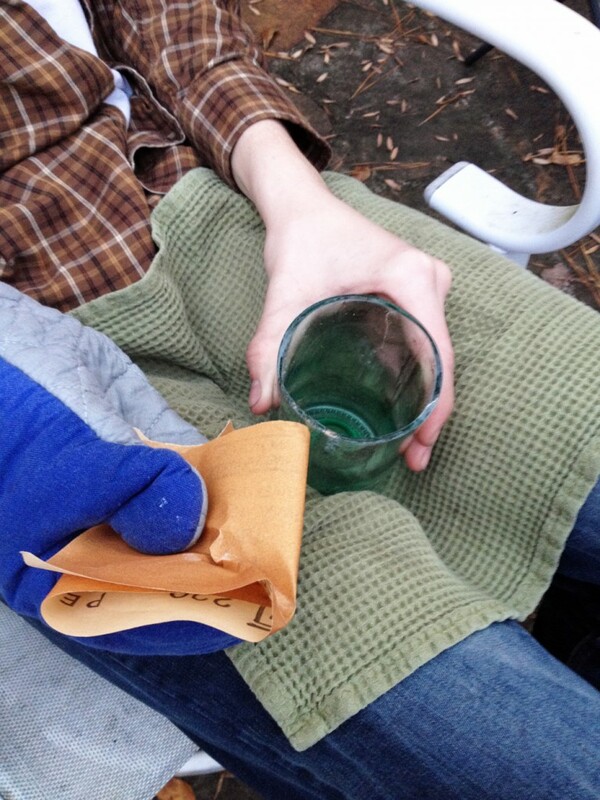 But, hopefully you get the gist of how to cut a glass bottle in half with my lame iPhone photos! These are the supplies we started with. These are not the supplies we ENDED with! 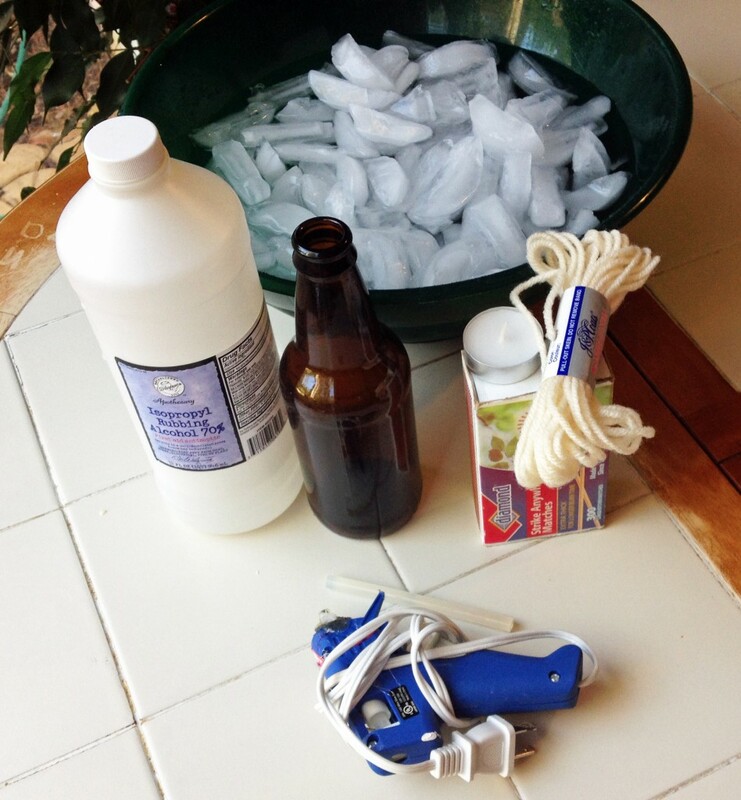 Supplies you will actually need: a glass bottle, cotton string, source of flame (lighter, match or candle), lighter fluid, paint brush, small glass bowl, large container of ice water, sand paper, and hot glue/decorations for your final craft project. 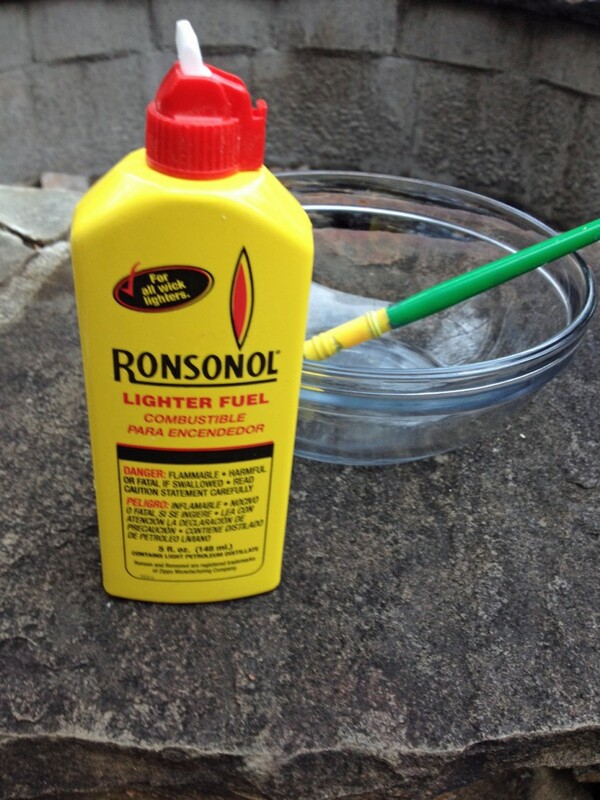 Videos we came across said to use EITHER rubbing alcohol, nail polish remover or lighter fluid. I will tell you right now, don’t waste your time with alcohol and nail polish remover. They don’t work worth a damn! Get lighter fluid. To keep your hands clean, apply it to the string with a paint brush. Have multiple glass bottles on hand. Once you figure out how to actually get them to break in half, you will realize that they don’t always break SMOOTHLY! The beer bottle we started with cracked in half but was so jagged there was no salvaging it so we moved onto a wine bottle. Have a lit candle on hand as your fire source. WAY easier than trying to light a match or holding the glass bottle one handed as you try to light a lighter. The candle worked much better for our uncoordinated group. You need a very absorbent string to make this work. Yarn didn’t really work well. Don’t get anything coated in wax. A thick, cotton string from the hardware store worked well for us. Tie the string tightly around the bottle, several times if possible. 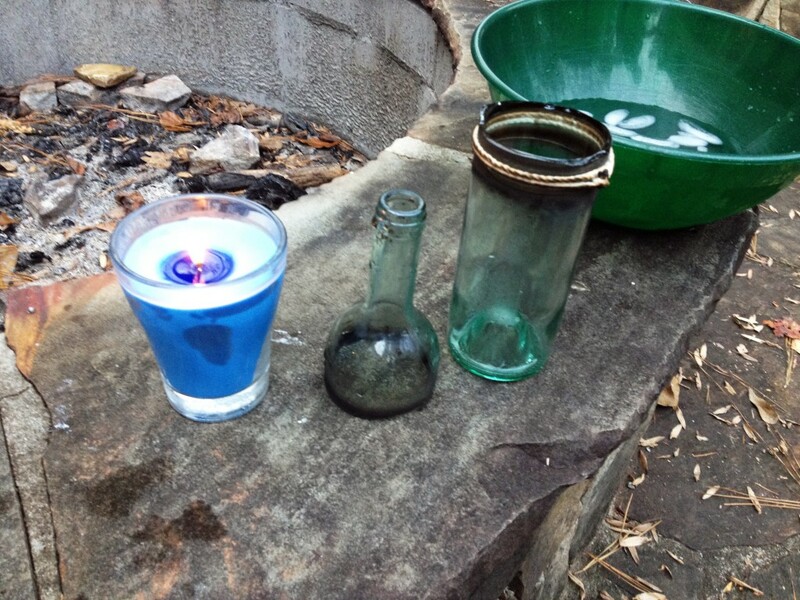 Then, grab a paint brush, glass bottle and lighter fluid. 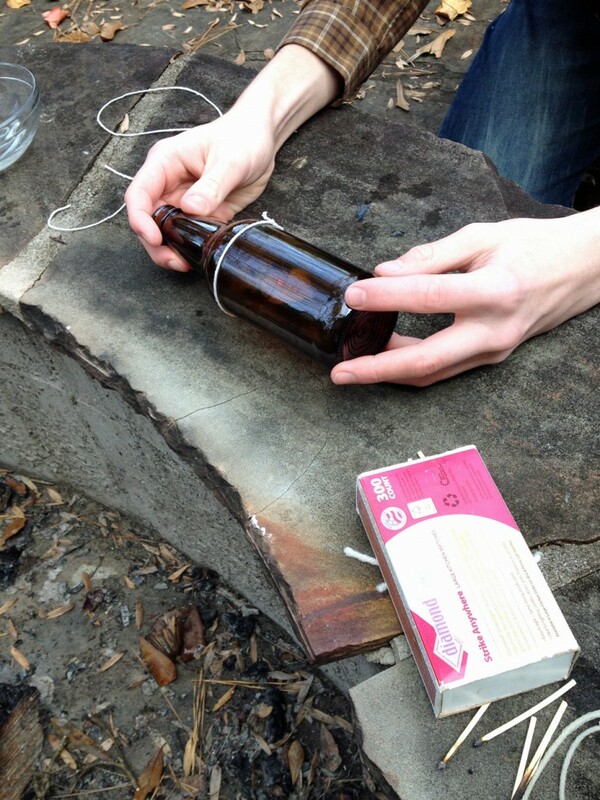 You need to SOAK the string in lighter fluid without getting it all over the glass bottle. Otherwise, the fire will spread! Just paint it on slowly and carefully. Try not to breathe in too many fumes and keep it off your skin. If you look VERY carefully in the photo, you will see a tiny little fire on the string around the beer bottle. That attempt was with rubbing alcohol. There is no photo of the lighter fluid attempt because there was a raging inferno in my hand and way too much yelling to get a photo of the fire itself. Suffice it to say that the lighter fluid will make REALLY BIG FLAMES…so please do this outside and not on a flammable surface! 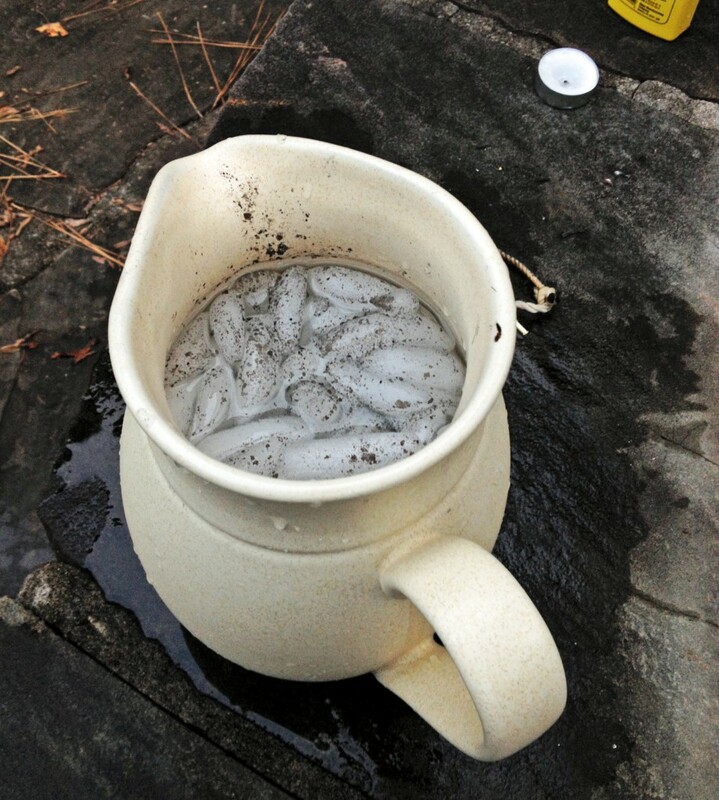 We originally started with a large BOWL of ice water, however it wasn’t deep enough to really plunge the wine bottle into it quickly and deeply. We moved to a tall pitcher. Use one that you don’t care if it gets dirty because there will be lighter fluid reside and nasty black crud in it by the time you are finished. Once your glass bottle is broken, you will need to smooth out the edges. You can use an electric sander if you have one but since my son was supposed to be doing this himself, I gave him sandpaper and a very thick glove to protect his hand from sharp edges. It will take a while and you need to be careful that you don’t get bits of glass on you, in your eye, or on the ground. We still ended up with some rough edges so we put some duct tape around it for safety purposes since it had to go to school with him. 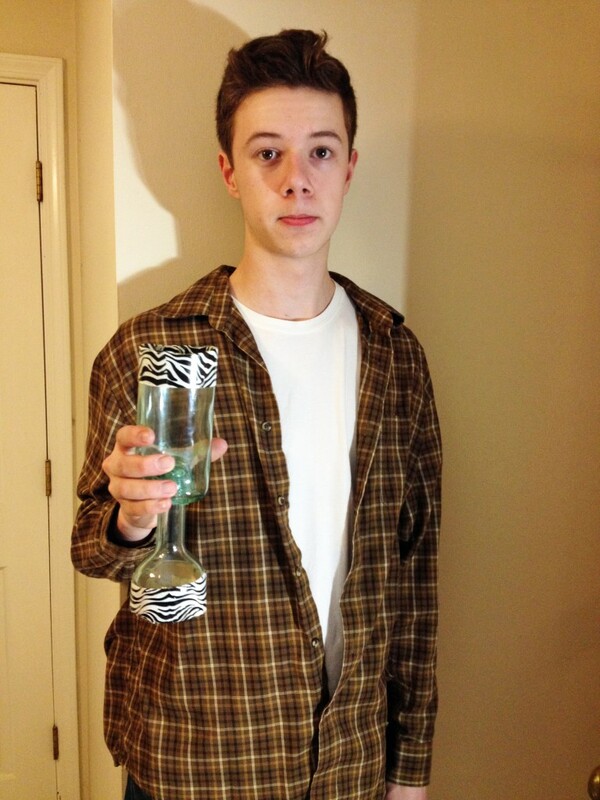 My son’s project proposal was to turn a wine bottle into a goblet or candle holder. Once you have the two pieces of wine bottle clean and smooth, just hot glue the mouth of the bottle to the base of the bottle as shown, making sure it is straight. Decorate as desired. This is my son, MANY hours after we first began this project. He apologized to me no less than 15 times for the stress and chaos he created by not listening to mom and choosing a difference project! But, he put in a lot of effort and hopefully will bring home a good grade for it. I can tell you for sure, this is NOT a project I will be trying again any time soon! If you want to see this project in a perfect how to video, you can check out the Crazy Russian Hacker. 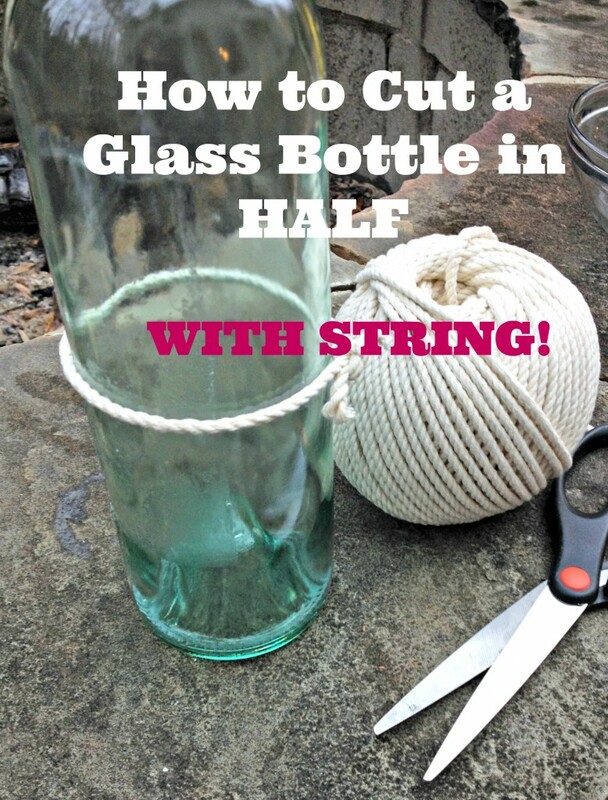 Now that you know how to cut a glass bottle in half with string, will YOU try it? If I needed to do this frequently or really wanted it beautiful and perfect I would buy a machine! 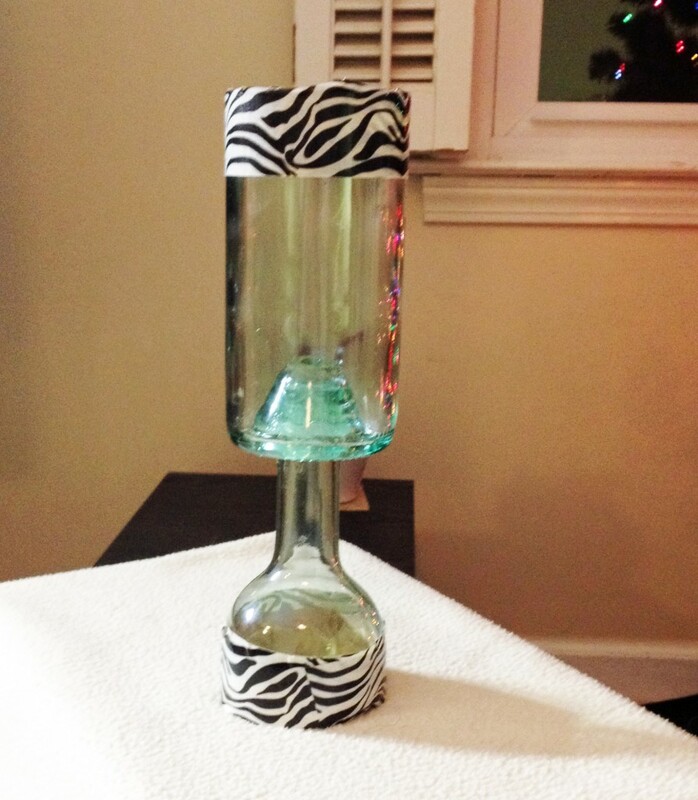 For personal use (like upcycling wine bottles into glasses for the family) I might just do it this way since it is cheap. I find that alot of things aren't as easy as the internet says they are and that frustrates me to no end! Glad you found the post helpful!